Ronald James Kind (born March 16, 1963) is an American politician serving as the U.S. Representative for Wisconsin's 3rd congressional district, since 1997. He is a member of the Democratic Party. The district is located in the western part of the state and is anchored by La Crosse, Eau Claire, Platteville, Stevens Point, Wisconsin Rapids, Prescott, and River Falls. Kind was born and raised in La Crosse, the third of five children born to Greta and Elroy Kind. His is the fifth generation of his family to live in the area. Kind's mother formerly worked as the assistant director of personnel in the La Crosse School District. His father had a 35-year career as a telephone repairman and union leader at the La Crosse Telephone Company. Kind attended the public schools in La Crosse and became a standout student athlete at Logan High School in both football and basketball. He accepted a scholarship to Harvard College, from which he graduated with honors in 1985. While attending Harvard, Kind played quarterback on the football team and worked during the summer for Wisconsin Senator William Proxmire in Washington. While working for Proxmire, he took part in investigations that helped determine the "winners" of the famous Golden Fleece Awards, presented by the senator to those responsible for government waste. Kind went on to receive a master's degree from the London School of Economics and a law degree from the University of Minnesota Law School. He practiced law for two years at the law firm of Quarles and Brady in Milwaukee, Wisconsin. Kind returned to his hometown of La Crosse to become a county prosecutor. He later served as a special prosecutor in several counties in western Wisconsin. Kind is the Democratic Chief Deputy Whip, co-founder of both the Upper Mississippi River Congressional Caucus and the Congressional Wildlife Refuge Caucus, and chair of the New Democrat Coalition. He voted with his party 87% of the time in the 112th congress and 94% of the time in the 111th congress. During the 114th Congress Kind was ranked as the 19th most bipartisan member of the U.S. House of Representatives and the most bipartisan member of the U.S. House of Representatives from Wisconsin in the Bipartisan Index created by The Lugar Center and the McCourt School of Public Policy, that ranks members of the United States Congress by their degree of bipartisanship (by measuring the frequency each member's bills attract co-sponsors from the opposite party and each member's co-sponsorship of bills by members of the opposite party). Kind's work on the Subcommittee of Health has been focused primarily on health care issues within small business. As a member of the Natural Resources Committee, he has worked on the restoration of the Mississippi River and has been especially concerned about invasive species that threaten the river's ecosystem. He also concentrates on agricultural reform. In October 1998, Kind was the only Democratic congressmen from Wisconsin to vote for a House inquiry into impeachment of President Clinton. On October 10, 2002, Kind voted in favor of authorizing the invasion of Iraq. Kind has supported women's issues, poverty reform, veterans issues, social security, environmental issues, education, and civil rights. Kind was the lone Wisconsin Democrat to support free trade with China, despite pressure from unions that claimed trade with China is costing jobs. After the failed effort to recall Governor Scott Walker in an April 2012 vote, Kind said that Democrats should be proud of forcing recall elections despite the outcome. He said that his conversations with voters had convinced him that the only reason that Democrats lost was because people didn’t think it was a proper use of the recall process. Kind stated he opposed Nancy Pelosi's bid for the Speakership of the House during late 2018, noting he voted against her two years back, saying to The Hill: “I’ve been consistent in saying we’re in desperate need of new leadership on both sides, as we move forward in the new Congress”. Kind and Senator Mark Udall introduced the Healthy Kids Outdoors Act, aimed at encouraging and supporting children's outdoor activities. He is the House sponsor of the FIT Kids Act, federal legislation that would require school districts to report on students' physical activity and to give youngsters health and nutritional information. In 2011, Kind wrote a piece about "the childhood obesity epidemic," in which he promoted both the FIT Kids Act and the Healthy Kids Outdoors Act. He said that healthy bodies lead to healthy minds, and that his FIT Kids Act would push parents and the public by requiring states and school districts to report on children's physical activity. As for the Healthy Kids Outdoors Act, it "provides state-level incentives to develop five-year state strategies to connect children, youth and families with nature and promote outdoor recreation in communities." The La Crosse Tribune reported in January 2014 that Kind was coming “under increasing criticism from those on the left who say his support of new free-trade agreements will kill jobs.” For example, he urged fellow House members to vote for the Trans-Pacific Partnership. “As a member of his district I'm frustrated with Ron Kind because I've been a supporter in the past,” said activist Karli Wallace. “It's a little embarrassing to me that he seems to wants to position himself as the fig leaf of bipartisanship that can help this skate through Congress somehow.” Kind also supported a measure that would allow future such deals to be negotiated without congressional involvement. “It's actually a crippling of democracy,” said Bill Brockmiller, president of the Western Wisconsin AFL-CIO. “Whether or not you support the TPP, fast-track authority to a lot of people's thinking is an archaic way of passing things and an offence to democracy." At the Democratic National Convention in 2016, Kind was scheduled to speak to a group of Wisconsinites when he was silenced by protesters from his state who opposed his support of the Trans Pacific Partnership trade deal. “There's confusion; people are conflating trade with trade agreements,” Kind insisted. “The trade that's going on absent trade agreements has not worked well for us: China, Brazil, India. We don't have trade agreements with those countries." Up through and during the 2012 campaign, Kind opposed any form of enhanced gun control, but after the Sandy Hook massacre he seemed to be open to it, saying, “We’re going to have to have a discussion while also keeping in mind the concerns of law-abiding, safety-conscious gun owners in America.” He added, “I just don’t see where armed guards or teachers with guns in our schools means freedom for our children." WIZM reported in February 2018 that Kind was one of a relatively small number of Democrats who had received contributions from the NRA. Since 2009, he had accepted $7,950 in from various NRA political action committees. He had also collected $5,400 from the Connecticut-based National Shooting Sports Foundation, which calls itelf "The Firearms Industry Trade Association." The NRA endorsed Kind in 2010. When then-presidential candidate Donald Trump called in 2015 for temporarily banning all Muslims from entering the United States, Kind said Trump was “playing in the same huddle as ISIS” and was making ISIS recruiting easier by playing into the terrorist group's narrative. In January 2017, Kind issued a statement in which he maintained that “President Trump's Executive Order blocking refugees and people from select Muslim countries from entering the United States does not reflect who we are as a nation. We cannot start discriminating based on religion. Instead of helping keep our country safe it will jeopardize our national security by giving ISIS and other terror groups another recruitment tool and making it harder for our allies in Muslim nations to work with us on counter-terrorism operations." In 2010, Kind supported the Student Aid and Fiscal Responsibility Act. On October 20, 2017, Kind rejected tax cuts, questioning their ability to invigorate the economy. Kind supported Obamacare, denying at a public event that insurers were cancelling insurance. Rather, they were signing customers up “with new plans that are compliant with ACA.” He insisted that under five percent of the population would lose their insurance under Obamacare and that most would “get a much better deal in the healthcare exchange - good price and much better benefits than what they were paying before.” He added that young people are “probably going to get a real good deal” under Obamacare. Kind voted against the 2017 Republican health-care bill. "I thought it was a bad piece of legislation,” he said, “both in the process of how it came together and the impact it will have for people back home." In October 2014, Kind said he supported “comprehensive immigration reform that secures our borders, helps our farmers and businesses meet their labor needs, and fairly addresses the millions of undocumented individuals in the shadows." On October 20, 2017, Kind spoke up for DACA, saying that the so-called Dreamers “are as American as anyone else's children." In October 2017, Kind announced a plan to protect the Mississippi River. It involved “four main parts: creating jobs by supporting recreation, tourism and navigation; maintaining railroad safety; supporting the Mississippi River Restoration Program; and promoting the 'Conservation on the Farm' bill. In October 2002, Kind voted to authorize the use of military force in Iraq. He later regretted that vote: “It was the wrong war at the wrong time for the wrong reason,” Kind explained. In a January 2007 letter to President Bush, Kind and a dozen-odd other Members of Congress wrote that success in Iraq “requires regional cooperation and positive engagement from all neighboring states. The history of the Middle East is too vast, too complex and too tumultuous to expect progress without an integrated diplomatic effort and multinational support from all of Iraq's neighbors. History is replete with centuries of marked violence and failed crusades, perpetrated by ignorance, arrogance and dogma." In September 2014, Kind said that he opposed “sending any military combat troops in order to deal with ISIS,” but expressed support for President Obama's “decisions to use targeted airstrikes in Syria and Iraq to degrade and destroy ISIS, and to send service members to assist Iraqi and Kurdish forces with training and intelligence." Kind announced in May 2014 that he would ask for the establishment of an independent bipartisan commission to investigate conditions at VA hospitals. Kind has said he supports legalizing medical marijuana but opposes “the full legalization of recreational marijuana." In February 2012, Kind applauded the U.S. Department of Labor for agreeing to re-examine a proposed rule that would prohibit children from working on family farms. “These rules would create an unnecessary burden on our family farmers,” said Kind. “They dont make sense and dont take into account the way our family farms operate." In July 2014, Kind introduced a bill that would prohibit the import of goods made by child labor, slave labor, or forced labor. “The United States must be a leader in elevating labor standards around the world. As a nation, it's critical that we stand united against exploitative labor practices in any country,” said Kind. Kind was first elected to represent Wisconsin's 3rd congressional district in November 1996. In September 1995, he had announced his intention to run for the 3rd Congressional District seat being vacated by 16-year incumbent Steve Gunderson. Kind later won a five-way race for the Democratic nomination and went on to defeat his Republican opponent, James Harsdorf, 52 percent to 48 percent, becoming only the third Democrat to represent this district in the 20th century and only the second in 88 years. Kind didn't face another contest nearly that close until 2010. He beat Republican Troy Brechler in 1998 with 128,256 votes to Brechler's 51,001. Kind defeated Susan Tully (R) in the general election, 64% to 36%. In the 2002 election, Bill Arndt, the Republican, received 69,955 votes, Kind received 131,038, and Jeff Zastrow, Libertarian, received 6,674. In 2004 he beat Republican Dale W. Schultz, who received 157,866 votes to Kind's 204,856. In 2006 he defeated Paul R. Nelson with 65 percent of the vote. In the 2006 election for Kind's seat, the main difference between Kind and his primary challenger, Chip DeNure, was “whether to set a timetable for withdrawing American troops from Iraq.” A majority of Americans, like DeNure, supported a timetable. DeNure believed the 9/11 attacks were “an inside job by terrorists within the U.S. government." In 2008 he won with 63 percent of the vote. In late 2009, Kind considered running for governor of Wisconsin in 2010 but ultimately said that instead, he would push in Congress for health-care reform. “My first responsibility must be to get affordable and accessible health care reform passed this year for all Wisconsin families,” he said. “That is why I cannot run for governor. I have a responsibility and duty to the people of Wisconsin to continue work on the health care reform agenda ahead of us." The Milwaukee Journal Sentinel reported, however, that he had given up on running for governor “after a poll showed that few Wisconsinites knew him." In 2010, local media described Kind as facing “what is widely considered his toughest re-election challenge.” His Republican opponent, state Sen. Dan Kapanke, “focused almost exclusively on three core GOP issues - less spending, lower taxes and smaller government." His opponent, Kapanke, criticized Kind for allegedly solicing thousands of dollars in 2007 from a group of Eau Claire doctors. He defeated Kapanke with 50 percent of the vote. There was talk that Kind might run for the U.S. Senate in 2012 to replace the retiring Herb Kohl, but he decided not to mount a primary challenge to Tammy Baldwin, who had already announced a senate run. There was also a push to draft Kind to run for governor in 2012 against Scott Walker. Kind ultimately decided to run for reelection in the 3rd district. He faced retired U.S. Army Col. Ray Boland in the November election and won. Kind beat GOP challenger Tony Kurtz, 56% to 43%. Kind beat Myron Buchholz, 81% to 19%, in the primary, and faced no challenger in the general election. The Hill reported that Kind was a “prime target” in the 2018 election. In February 2018, Kind's primary opponent Juliet Germanotta was arrested in New York City on an outstanding warrant for grand theft. She had bought a $4,800 ring from a jewelry store, then received a full refund after returning a less valuable ring. On November 6, 2018, Kind was reelected over Republican opponent Steve Toft by 19.4%. Kind and his wife, Tawni, live in his hometown of La Crosse. She is an official court reporter for the County Court system. They have two sons, Johnny (born in August 1996) and Matthew (born in May 1998). They are members of Immanuel Lutheran Church (Wisconsin Evangelical Lutheran Synod). Kind is a member of the La Crosse Optimists Club, a leader in the Boys and Girls Club, and the La Crosse YMCA. He is also on the board of directors for Coulee Council on Alcohol or Other Drug Abuse. His wife organizes the annual Congressional Art Competition for high school artists in western Wisconsin. In October 2009, The Hill profiled Kind, focusing on his challenge to “the Democratic status quo.” While calling him “an influential voice on...ethics,” The Hill also noted that Kind had refused to join in the effort that year to have Ways and Means Chairman Charles Rangel (D-N.Y.) step down amid an ethics probe involving Rangel's taxes. “We're all ultimately human and none of us are perfect and we're all prone to mistakes from time to time,” Kind had explained. “If that becomes that new standard - that any mistake is subject to dismissal or losing their position - then that's going to be a very tough standard for each and every member to have to live up to." In October 2010, two doctors at the OakLeaf Surgical Hospital in Eau Claire charged that Kind had demanded campaign donations before meeting them to discuss the Children's Health and Medical Protection Act. Kind denied the accusation. One of the accusers, a surgeon who requested anonymity, asserted in a sworn statement that a Kind aide explained that he “typically requires a contribution of $10,000 for a one to two-hour personal meeting and $25,000 for a half-day meeting." 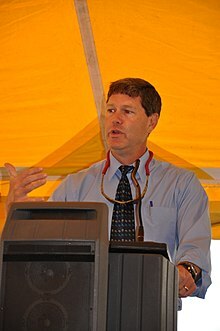 ^ a b c d "US Representative Ron Kind - Wisconsins Third Congressional District". House.gov. 2009-02-27. Archived from the original on 2009-02-27. Retrieved 2012-08-25. ^ "Membership". Congressional Arts Caucus. Retrieved 21 March 2018. ^ "Members". New Democrat Coalition. Retrieved 6 February 2018. ^ "Members". Congressional NextGen 9-1-1 Caucus. Retrieved 8 June 2018. ^ "90 Current Climate Solutions Caucus Members". Citizen´s Climate Lobby. Retrieved 20 October 2018. ^ "The U.S. Congress votes database". The Washington Post. Retrieved August 28, 2012. ^ "The Lugar Center - McCourt School Bipartisan Index" (PDF). The Lugar Center. March 7, 2016. Retrieved April 30, 2017. ^ "Congressman Ron Kind : About Ron". Kind.house.gov. Retrieved 2010-07-12. ^ Bump, Philip. "For 101 members of Congress, life may soon get very awkward". The Washington Post. Retrieved 20 August 2018. ^ "Project Vote Smart - Representative Ronald James 'Ron' Kind - Interest Group Ratings". Votesmart.org. 2010-05-14. Retrieved 2010-07-12. ^ "Ron Kind Wisconsin 2012 election center". Retrieved August 23, 2012. ^ "Ron Kind on the issues". Retrieved August 23, 2012. ^ "NBC 15 Madison, Wisconsin". Retrieved August 23, 2012. ^ Jackie Ostfeld. "Time to Create an ECHO Across America: Every Child Healthy Outdoors". Huffington Post, August 8, 2014. ^ "Healthy Kids Outdoors Act Supports Strategies to Connect Kids with Nature". Izaak Walton League of America, November 3, 2011. ^ "NFL News". Retrieved August 24, 2012. ^ Kind, Ron. "Halting the childhood obesity epidemic requires support of many communities". Retrieved August 24, 2012. ^ Hubbuch, Chris. "Rep. Ron Kind to eye crop subsidy reform". Retrieved August 27, 2012. ^ Davis, Julie (July 25, 2007). "Farm bill spurs split in Dem's ranks". Bangor Daily News. ^ Kind, Ron. "Ron Kind: Why I'm fighting for a trade deal". La Crosse Tribune. Retrieved 22 August 2018. ^ Hubbuch, Chris. "Kind under fire from left over free trade". La Crosse Tribune. Retrieved 22 August 2018. ^ Sommerhauser, Mark. "At national convention, Ron Kind faces flack on TPP". Winona Daily News. Retrieved 22 August 2018. ^ Hubbuch, Chris. "Walz, Kind weigh in on gun rights, school safety". Winona Daily News. Retrieved 22 August 2018. ^ "La Crosse's Ron Kind among the recipients of gun lobby contributions". WIZM. Retrieved 22 August 2018. ^ Lindquist, Eric. "FRONT PAGE Kind rejects growing call for U.S. troops to fight IS". Leader-Telegram. Retrieved 22 August 2018. ^ Weigel, David. "Democratic lawmakers from states and districts won by Trump oppose travel ban". The Washington Post. Retrieved 22 August 2018. ^ "FINAL VOTE RESULTS FOR ROLL CALL 718". H R 3221 RECORDED VOTE. clerk.house.gov. Retrieved 27 August 2018. ^ a b "U.S. Rep. Ron Kind Discusses Taxes, Healthcare, Immigration". Wisconsin Public Television. Retrieved 27 August 2018. ^ Lyon, Barbara. "Kind: Health care reform can work". The Chippewa Herald. Retrieved 27 August 2018. ^ Cuevas, Jason. "Kind: Health care bill 'a bad piece of legislation'". Juneau Star-Times. Retrieved 27 August 2018. ^ a b "Kurtz, Kind answer questions". La Crosse Tribune. Retrieved 27 August 2018. ^ "U.S. Rep. Ron Kind unveils plan to protect Mississippi River". WKBT-TV. Retrieved 27 August 2018. ^ Hubbuch, Chris. "CAMPAIGN PROFILE: ROn Kind". La Crosse Tribune. Retrieved 27 August 2018. ^ Hay Brown, Matthew. "Gilchrest calls on Bush to open talks". The Baltimore Sun. Retrieved 27 August 2018. ^ Berman, Howard. "Letter to President George W. Bush". Vote Smart. Retrieved 27 August 2018. ^ "Rep. Ron Kind Statement on the Obama Administration's ISIS Strategy". kind.house.gov. Retrieved 29 August 2018. ^ Tighe, Mike. "Kind 'mad as hell,' wants bipartisan panel to probe VA". La Crosse Tribune. Retrieved 29 August 2018. ^ "Kind Applauds Administration's Dismissal of Proposed Child Labor in Agriculture Rule". kind.house.gov. Retrieved 29 August 2018. ^ "Rep. Ron Kind Introduces Bill to Stop Child Labor Overseas". kind.house.gov. Retrieved 29 August 2018. ^ "STATISTICS OF THE CONGRESSIONAL ELECTION". clerk.house.gov. Retrieved 22 August 2018. ^ "STATISTICS OF THE CONGRESSIONAL ELECTION" (PDF). clerk.house.gov. Retrieved 22 August 2018. ^ Magney, Reid. "Kind's stance on war in Iraq inspires DeNure's campaign". Coulee Courier. Retrieved 22 August 2018. ^ "Kind won't run for Wisconsin governor". Wisconsin State Journal. AP. Retrieved 22 August 2018. ^ Umhoefer, Dave. "Eyes on Barrett as Kind opts out of governor's race". Journal Sentinel. Retrieved 22 August 2018. ^ Lindquist, Eric. "Kind's toughest challenge". Leader-Telegram. Retrieved 22 August 2018. ^ Stewart, Rebecca (September 15, 2011). "Rep. Ron Kind declines senate bid". CNN. Retrieved August 26, 2012. ^ "Kind, Obey avoid confirming recall petition signatures". Retrieved August 26, 2012. ^ Shuda, Nathaniel. "U.S. Reps. Paul Ryan, Ron Kind share diverging viewpoints during Wood County visits". Retrieved August 26, 2012. ^ "Wisconsin's 3rd Congressional District elections, 2014". Ballotpedia. Retrieved 22 August 2018. ^ Kamisar, Ben. "Lawmakers targeted as district politics shift". The Hill. Retrieved 22 August 2018. ^ "Chicago Sun-Times Backs Lipinski". National Journal. Retrieved 22 August 2018. ^ "Congressman Ron Kind : About Ron". Facebook.com. Retrieved 2018-09-29. ^ "Elect Ron Kind for Congress - Wisconsin Third Congressional District". Ronkind.org. Retrieved 2010-07-12. ^ Crabtree, Susan. "Killing them with Kind-ness: Rep. Kind uses diplomacy to challenge leaders". The Hill. Retrieved 27 August 2018. ^ Bice, Daniel. "Political mystery unfolds in Western Wisconsin". Milwaukee-Wisconsin Journal Sentinel. Retrieved 27 August 2018.